follow the directions to login and set up your feeds. Someone much smarter than I can probably make a pugin to take full advantage of the streaming capability of SirriusXMStreamer, but I shared what I figured out! Cheers! This is great, exactly what I was looking for! I added the feeds in the Serviio console, checked the url and get the green checkmark that it's ok, but when I go to play the feed on the WDTV Plus, it doesn't play. 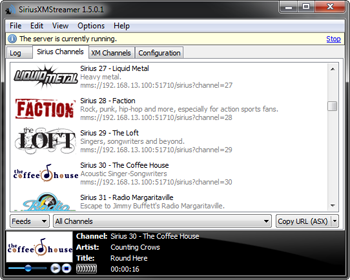 I added the channels, and can play it through the XMSiriusStreamer player, but it won't play on my media player. OK, I was able to get the channels to stream, but it's very choppy, pretty much unlistenable. I have cable internet up to 50 mbps, so that should be plenty. Is it in the transcoding where it could be a problem? Is my system too slow to handle it? I'm using the WDTV profile, not the generic profile. On my setup in comes in choppy for about 10 seconds and then it works perfectly. Hi everyone, where can I find the latest version to update, thnks!